The Sunday school is open to all ages of children. For those who are three and under, creche facilities are provided (for parents who wish to join the worship service). Meeting in the small hall before the Mass at 10:30 a.m. the structured activities help the young people learn about Jesus. Please contact Joyce Reid for further information or turn up on the day. Enjoy keeping fit and healthy, have fun and meet new friends, at a gentle exercise and movement class for mature members. The class times are Monday 2.00 p.m. - 4.00 p.m. and Friday 10.00 a.m. - 11.30 a.m. with a short break half way through for tea/coffee. If you are interested contact Doreen Shelley on Blackpool 692474 for a chat. Mothers and Toddlers meet during term time. Activities and toys for children and refreshments provided. This activity is absolutely free and it attracts 40-50 children and their carers. All welcome. Please turn up on the day or contact Joyce Reid for further information. Please note the change of time, 9.45 a.m. - 11.45 a.m.! 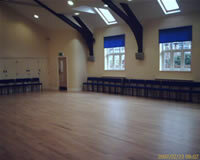 Line dancing every Tuesday from 7 p.m. For more information please turn up on the evening. Mass on Thursday (12.30 p.m.) is followed by a cooked lunch. Anyone who visits the church on the Thursday to attend Mass is welcome to join us for lunch; this normally consists of a cooked meal followed by sweets (and fruit), cheese and biscuits and then refreshments. There are usually around twenty people that join us so it is a popular event. There is no fixed price for this and therefore donations towards the cost of lunch are invited. Members of the Senior Citizens welcome club normally combine Mass with lunch and then go on to their afternoon activities.